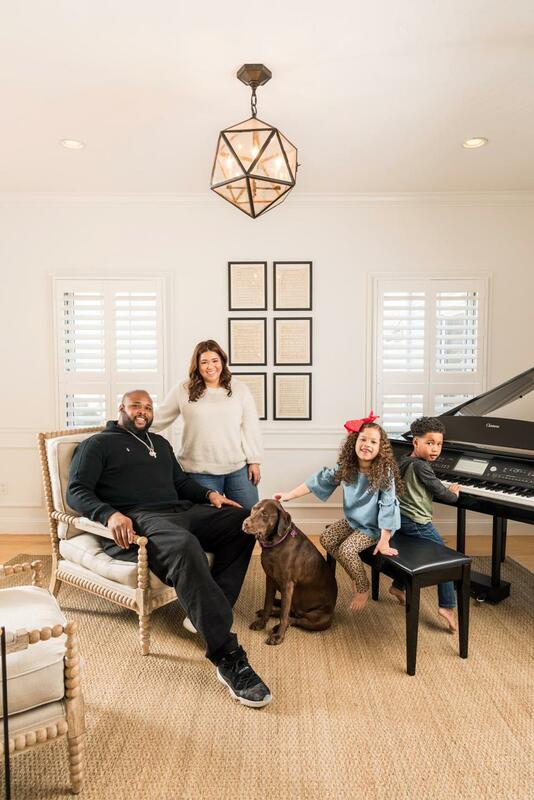 Marcus Cannon settles his young family into a bright five-bedroom home filled with nods to his Texas roots. 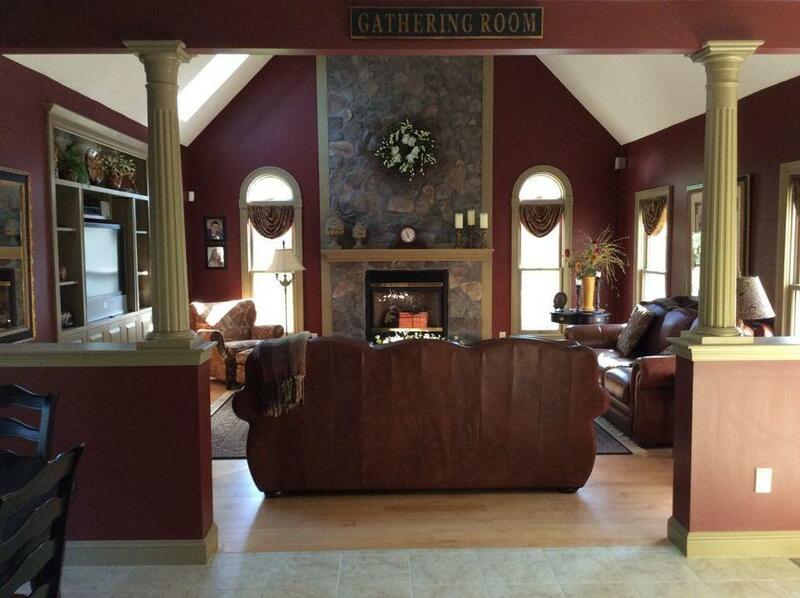 Marcus, Alyssa, Mady, and M.J. Cannon put down roots in this five-bedroom house in Wrentham, down the road from Gillette Stadium. 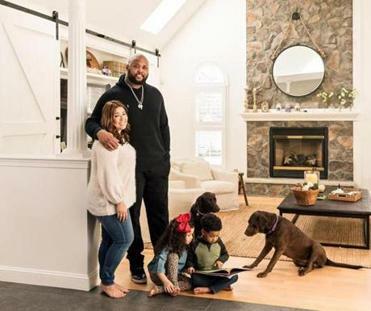 After six years of shuttling between a rented farmhouse in Foxborough and their hometown of Fort Worth, Texas, New England Patriots offensive tackle Marcus Cannon and his wife, Alyssa, decided to it was time to buy in Massachusetts. “With our daughter starting kindergarten, we needed stability,” Alyssa says of Mady, now 6. Following the team’s fifth Super Bowl win, in 2017, the Cannons closed on a five-bedroom house in Wrentham, down the road from Gillette Stadium. 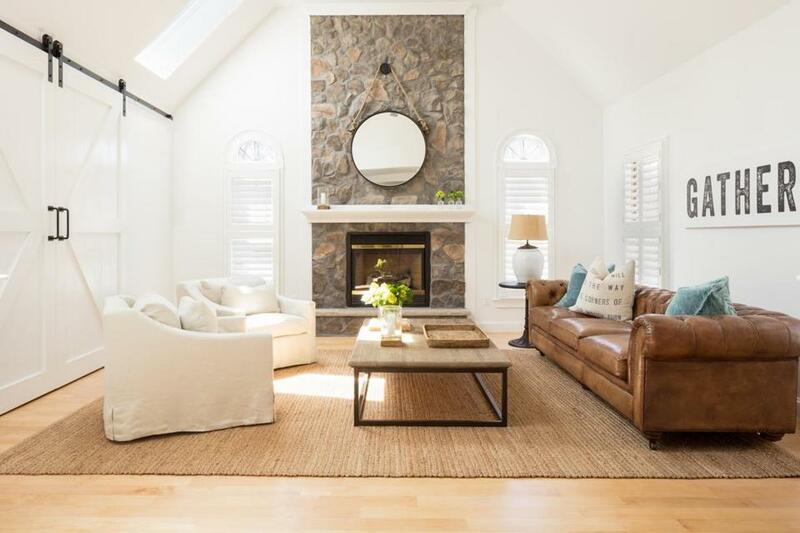 Then the college sweethearts and their children, Mady and M. J., now 4, took off for vacation, leaving Walpole-based designer Kelly McGuill to pull off a complete transformation. In seven weeks. The changes were cosmetic, the results profound. The house is a bright, peaceful oasis, with subtle Texan touches throughout, a nod to the family’s roots (Marcus and Alyssa met at Texas Christian University). “Sunlight flooded in once we started dismantling,” McGuill says. 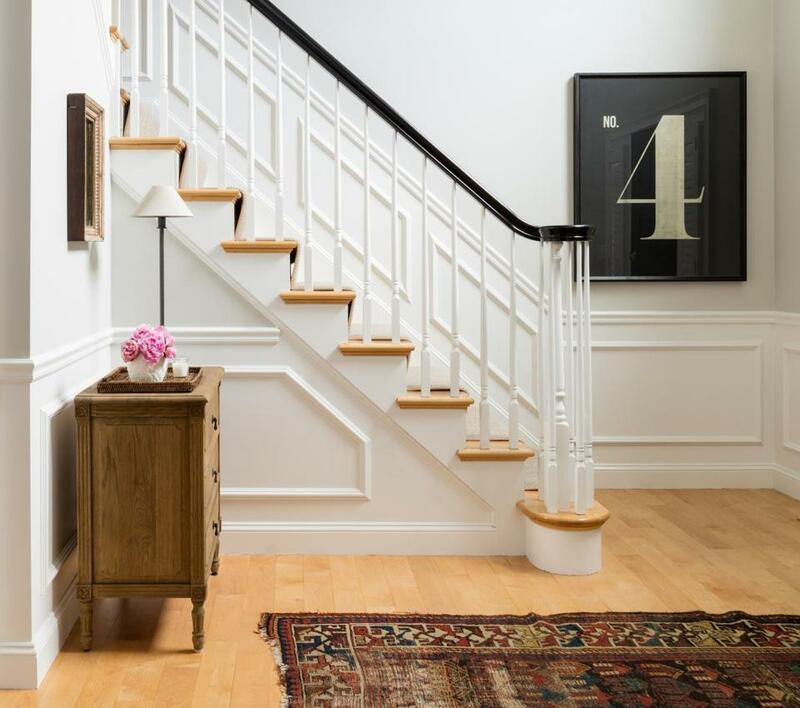 She repainted the whole interior, mainly in Benjamin Moore White Dove, refinished the kitchen cabinets, added shiplap to the side entry hall, tweaked built-ins, and hung plantation shutters. “Sturdy” and “strong” were buzzwords on the project. “When you host Thanksgiving for the offensive line, you don’t want the furniture to break,” Alyssa says. 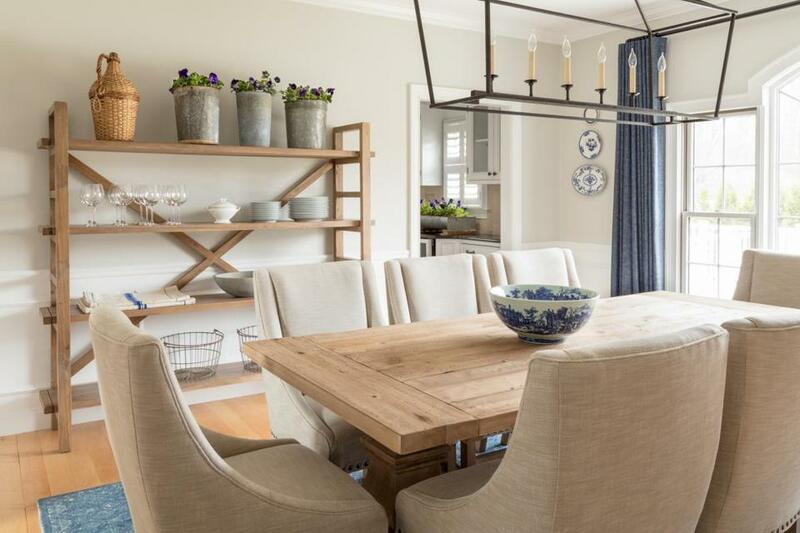 “I can’t tell you how many chairs and tables we’ve gone through.” For the dining room, McGuill opted for a massive salvaged-pine trestle table and roomy weathered oak chairs upholstered in performance fabric, all from Restoration Hardware. The room channels McGuill’s breezy aesthetic, the heavy furniture softened by infusions of blue. McGuill reworked the built-ins by removing the shelves (save for the top one, which now holds vintage encyclopedias from Texas) to accommodate a television. Barn-style doors slide shut to hide the big screen. “It’s beautiful, clean, and simple, open or closed,” McGuill says. The vintage leather Chesterfield sofa, a durable choice that looks even better with age, is 9 feet long and extra deep, a critical factor when the man of the house is 6 feet 6 inches and 335 pounds. It’s been especially convenient since Marcus suffered an ankle injury, which has limited his mobility and landed him on injured reserve in December. Normally, he decompresses in the media room on the lower level, where the vibe is more masculine. If you’re imagining raucous sports-fueled afternoons, however, you’re mistaken. “He’s more of a National Geographic, History Channel kind of guy,” his wife says. Marcus’s job is football; his hobbies are film, painting, and music. The couple asked McGuill for a music room with a baby grand piano. The furnishings are spare: a pair of spindle chairs, an Oly bench with a cowhide cushion, and a vintage industrial shoe rack used as shelving. 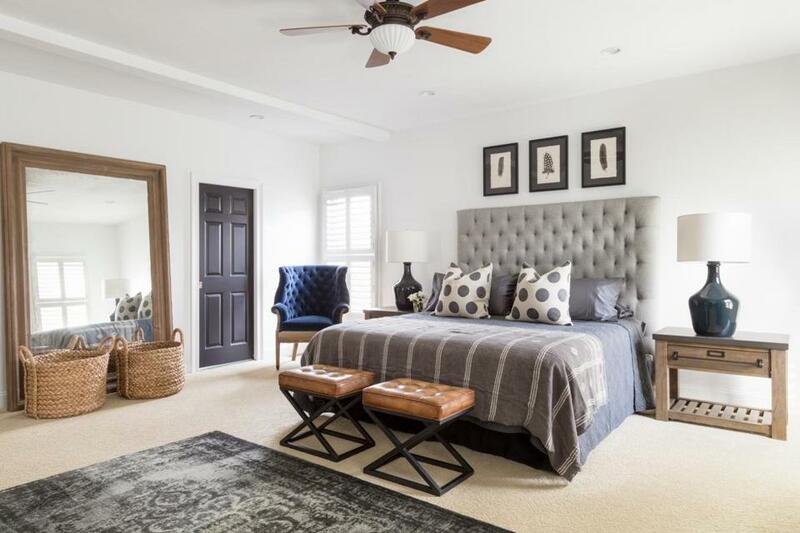 A jute rug adds texture, while a convex mirror and geometric pendant provide crisp accents. The room’s black feature wall is Alyssa’s favorite part of the house. McGuill hung framed vintage sheet music of tunes including “The Yellow Rose of Texas” and “Deep in the Heart of Texas.” It’s something Alyssa had thought of doing but never mentioned to McGuill. Along with serendipitous developments like that, there were some welcome surprises, such as the vintage-style train station departure sign listing half a dozen places the Cannons have lived. When Marcus saw the framed “4” in the entry, number 61 thought McGuill had gotten his jersey number wrong. “It represents the number of people in the family,” she says. Marcus, Alyssa, Mady, M.J., and one of the family’s two Labradors gather near the piano. “It’s a place dedicated to playing and listening,” designer Kelly McGuill says of the music room. The home’s dining room, before the renovation. 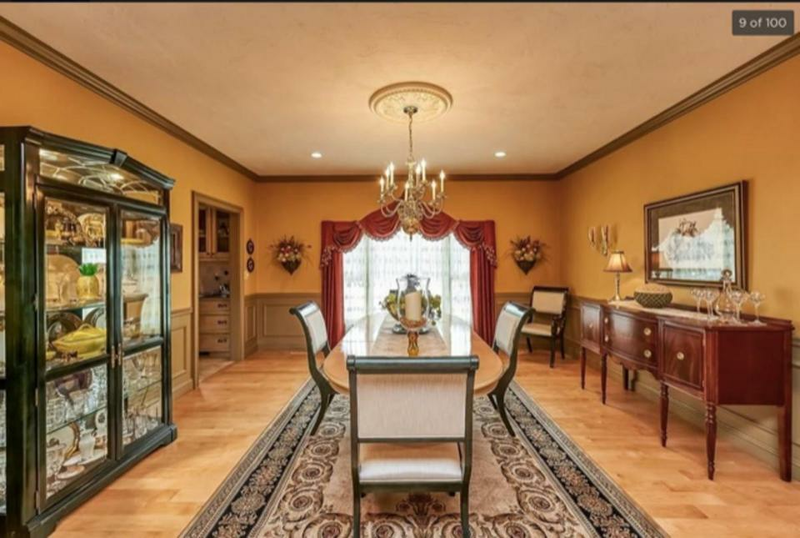 AFTER: McGuill used more color in the dining room than elsewhere in the home. The blue linen draperies and rug soften the space, and vintage plates from a local antique shop add color and interest to the walls. Open shelving makes displaying and storing extra glasses and dishes easy. The Visual Comfort open lantern pendant light keeps the eye moving across the space. The family room, before the renovation. AFTER: The large jute Pottery Barn rug in the family room is soft, textural, and practical for a family with kids and dogs. “I’m one for adding texture anywhere I can,” McGuill says. The Restoration Hardware swivel chairs can face either the television or the sofa. The reclaimed-wood-and-metal coffee table is durable but not blocky.